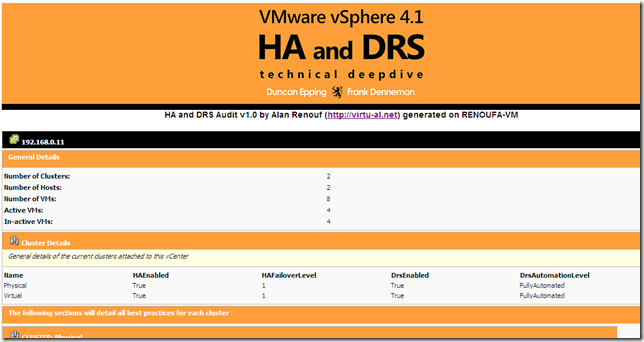 Duncan Epping and Frank Denneman are two of the biggest rockstars in the VMware Community, recently they wrote a fantastic book on HA and DRS, this can be downloaded for a fantastic price from here, if you dont have it then you are not a VMware admin ! But wouldn’t it be great if we could have our own little Duncan or Frank to carry around in our pocket and check our clusters out for HA and DRS issues and best practices – Well now you can – no I haven’t created bobble headed characters, instead I have created….. 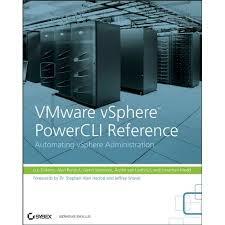 This is a script which was created from the best practices and information in the HA and DRS book, run it against your vCenter and it will check your clusters for information in the book, each part will be shown in a nice HTML report and will give you page numbers and information from the book. This is not to be used as a replacement for the HA and DRS book, quite the opposite, it is used to compliment the book and tells you which pages to look at for information within the book. So far I have only read the first 50 pages so all the information in V1.0 of the script is related to the first 50 pages but as I read more I will add more checks and update the script. Am not able to see the download link, can you please post the link to download. mmm….vCheck script does not check for HA and DRS settings..
Is it possible to automate the script, schedule it and email the report? No but most of these checks are in the vCheck script which can be scheduled. Unless of course you modify the code.